▶ Will It Fit My Boat? 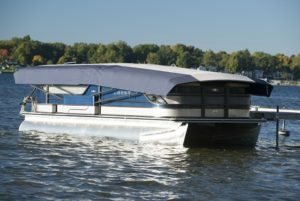 +Bridge position which lowers the Easy Cover� providing even more shade and allowing you to pass easily under many channel bridges. 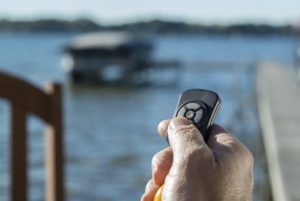 The key fob is a small, user-friendly remote control with a power button and four pre-programmed position buttons that allow you to switch between positions at will. 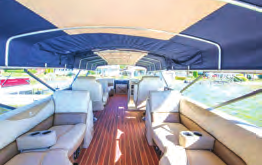 You know better than anyone, pontoon boats are a significant investment. The Easy Cover� will protect your investment for years to come, which means longer life and a much higher resale value. 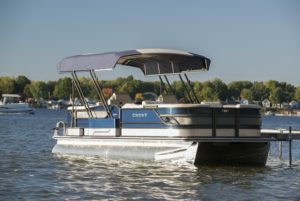 By making it so easy to cover your pontoon, there�s never a reason to leave your boat uncovered when you�re not using it and your interior is protected from the baking effects of the sun. 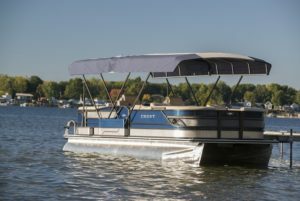 The Easy Cover� protects your pontoon, while affording you the convenience to that will effortlessly get you out on the lake in seconds.